Adopted on May 5, 2014. The Mount Holly mammoth tooth and tusk was adopted as Vermont's second official state fossil 11 years after its first, the white whale fossilized skeleton at the University of Vermont's Perkins Geology Museum. Mount Holly mammoth tooth and tusk at the Mount Holly Community Historical Museum was adopted as the official "state terrestrial fossil" and the fossilized skeleton at the University of Vermont's Perkins Geology Museum was renamed the official "state marine fossil" when Governor Peter Elliott Shumlin signed House Bill No. 589 on May 5, 2014. The tusk of a fossil elephant was found in a muck bed about 5 feet below the surface, on the farm of D. S. Pratt, in this town, on Saturday, Sept. 2, by a workman who was digging muck. The tusk is forty-four inches in length, and eighteen inches in circumference at the largest end, and eleven inches at the smallest. It is in a fair state of preservation, although some parts of it crumbled after being exposed to the air. The workman on discovering it took a piece to Mr. Pratt, remarking as he handed it to him, that he had found a curious piece of wood. Mr. Pratt on looking at it discovered its true nature. 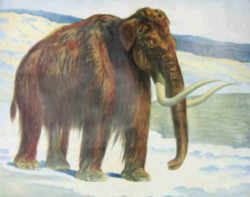 This tusk belonged to a species of elephant long since extinct, supposed to be the Elephas, Primogenius (or mammoth) Blumenback, that inhabited the northern parts of North America, having wandered across the Siberian plains to the Arctic Ocean and Behring Straits and beyond to this country south to about the parallel of 40 degs. Their bones show them to have been about twice the weight and one-third taller than our modern species. The remains, (tusks, teeth, and several bones,) of one of these elephants were found at the summit of the Green Mountains, at Mount Holly, in 1848, by workmen engaged in building the railroad from Bellows Falls to Rutland. These remains were found in a muck-bed, eleven feet below the surface and at an elevation of 1415 feet above tide water. Most of the bones found, including a molar tooth, were taken by the workmen and others and carried out of the State. The most perfect tusk was secured by Prof. Zadock Thompson and is lodged in the State Cabinet at Montpelier. This tusk was 80 inches long and four inches in diameter. The molar tooth, now in the possession of Prof Agassiz, weight 8 pounds and presents a grinding surface of eight inches long and four broad. A plaster cast of it is on exhibition with the tusk at our State Cabinet. These specimens of extinct animal life tell a wonderful history of ages long past. How much light they would shed upon science if they were capable of communicating to man an account of the condition of this continent when they inhabited these mountains, long before the Indian, who had an existence here. It seems evident that from the commencement of animal life here a constant change has been going on, one kind preparing the way for another and more useful. If this be a fact does it not argue that even man is here to make preparation for a higher being, and will, in time, become an extinct species? A constant change has been going on from the creation and we cannot see why there should be any limit to progress. The Indian seems to have been the first creative intelligence, and he is fast fading from sight--passing away as civilization progresses. "...the elephant from Mt. Holly"
Text taken from page 176 of the Report on the Geology of Vermont: Descriptive, Theoretical, Economical, and Scenographical; Vol. I by E. Hitchcock, LL.D., A.D. Hager, A.M., E. Hitchcock, Jr., M.D., and C. H. Hitchcock, A.M., 1861. "REMAINS OF TERRESTRIAL MAMMALIA IN ALLUVIUM"
"The most important mammalian fossil of this kind is the elephant from Mt. Holly. We give Professor Thompson's description of it:"
Elephas primogenius, Blumenbach. It is a remarkable fact, that in making the Rutland and Burlington Railroad, which extends from Burlington to Bellows Falls, two of the most interesting fossils ever found in New England were brought to light. These were the remains of an elephant and a whale. The former were found in Mt. Holly, in 1848, and the latter in Charlotte, in 1849. 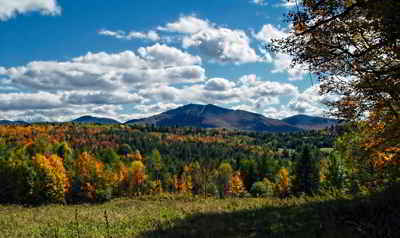 "The Rutland and Burlington Railroad crosses the Green Mountains in the township of Mt. Holly, at an elevation of 1415 feet above the level of the ocean, and the bones of the fossil elephant were found at that height. It is in a peat bed east of the summit station that these bones are found. The basin in which the peat is situated appears to have been originally filled with water, and to have been a favorite resort for beaver, a large proportion of the materials which formed the lower part of the peat consisting of billets of wood, about eighteen inches long, which had been cut off at both ends, drawn into the water and divested of the bark by the beaver, for food. The peat was fifteen feet deep before the excavation was made for the railroad. "In making this excavation, the workmen found at the bottom of the bed, resting upon gravel which separated it from the rock below, a huge tooth. The depth of the peat at that place was eleven feet. Soon afterwards one of the tusks was found, about eighty feet from the place of the tooth mentioned above, which was a grinder. Subsequently the other tusk and several of the bones of the animal were found near the same place. These bones and teeth were submitted to the inspection of Professor Agassiz, who pronounced them to be extinct species of elephant. The directors of the R.& B.R.R. to whom they belong, placed them in the museum of the University of Vermont, for preservation, and for the illustration of our fossil geology. "The grinder is in an excellent state of preservation, and weighed eight pounds, and the length of its grinding surface is about eight inches. The tusks are somewhat decayed, and one of them badly broken. The cord, drawn in a straight line from the base to the point of the most perfect tuck , measures sixty inches, and the longest perpendicular, let fall from that to the inner curve of the tusk, measures nineteen inches. The length of the tusk, measured along the curve on the outer surface, is eighty inches, and its greatest circumference twelve inches. The circumference has diminshed very much, since the tusk was taken from the peat bed, on account of shrinkage in drying, and several longitudinal cracks have been found in it, extending its whole length, and it was found necessary to wind it with wire to prevent it from splitting to pieces." In 1858 remains of another elephant were found in Richmond, which are now in the Cabinet of Vermont University. 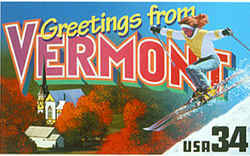 The fossil ham of some ruminant has been found in Hartford; and the ham of a deer in the alluvium of Grand Isle; the latter specimen is in the Cabinet of Vermont University. 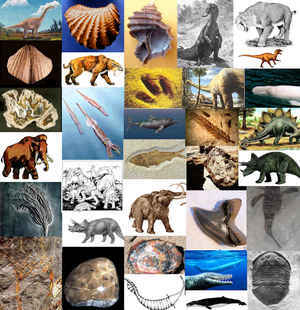 Other fossils are found in a cave at Chittenden,- the bones of small animals, such as are now alive." On February 5, 2014, House Bill No. 188 was introduced by State Representatives Dennis Devereux, of Belmont, Tim Jerman, of Essex Jct., and Will Stevens, of Shoreham. It was referred to the House Committee on General, Housing and Military Affairs where it languished. However House Bill No. 188 never made it out of committee. Statement of purpose of bill as introduced: This bill proposes to designate the current state fossil, the white whale fossilized skeleton, as the state marine fossil, and to designate the Mount Holly mammoth tooth and tusk as the state terrestrial fossil. (a) Two excellent historical discoveries were made in the late 1840s during excavation for the Rutland and Burlington Railroad. The first, in 1848, was the discovery of the fossilized mammoth tooth and tusk in Mount Holly, and the second, in 1849, was the discovery of the fossilized white whale skeleton in Charlotte. (b) The white whale fossilized skeleton, which was found in Charlotte in 1849 embedded in clay at the depth of about eight feet below the natural surface of the ground, was designated the state fossil in 1993. (c)(1) The remains of the mammoth were found in 1848 during excavation for the Railroad where, at an elevation of 1,415 feet above sea level, the Railroad was to cross the ridge of the Green Mountains in Mount Holly. There, at the bottom of an 11-foot muck bed, workers found, resting upon gravel, a huge molar tooth weighing nearly eight pounds and having a grinding surface of approximately eight by four inches. Shortly thereafter, the workers found a large fossilized tusk of the mammoth that measured along its outer curve a length of 80 inches, and 12 inches at its greatest circumference. (2) The Mount Holly mammoth tooth and tusk are now on display at the Mount Holly Community Historical Museum. 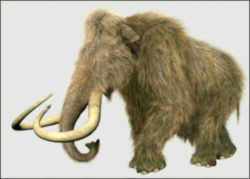 (3) Scientists believe the mammoth fossils were buried at the summit of the Green Mountains for more than 8,000 years, and that an adult mammoth would have been more than eight feet tall and 10 feet long, and would have weighed approximately 1.7 tons. (a) The state marine fossil shall be the white whale fossilized skeleton at the University of Vermont's Perkins Geology Museum. (b) The state terrestrial fossil shall be the Mount Holly mammoth tooth and tusk at the Mount Holly Community Historical Museum. But, at the end of February, House Bill No. 589, an act relating to hunting, fishing, and trapping, had been passed in the House and forwarded to the Senate for consideration. The bill was read for the first time and referred to the Committee on Natural Resources and Energy. Senate action on the bill was delayed until the first of April. On April 10th, House Bill No. 589 was approved by the Senate, with amendments. Two of those approved amendments concerned House bills that had been ignored by the House. One of the amendments designated the Governor Aiken bucktail streamer the official fly-fishing fly of the State of Vermont. The other amendment re-designated the white whale fossilized skeleton at the University of Vermont's Perkins Geology Museum the official "state marine fossil" and the Mount Holly mammoth tooth and tusk at the Mount Holly Community Historical Museum the official "state terrestrial fossil" of the State of Vermont. The Mount Holly mammoth tooth and tusk at the Mount Holly Community Historical Museum was adopted as the official "state terrestrial fossil" and the fossilized skeleton at the University of Vermont's Perkins Geology Museum was renamed the official "state marine fossil" when Governor Peter Elliott Shumlin signed House Bill No. 589 on May 5, 2014. This act addresses multiple provisions related to hunting, fishing, and wildlife management. The act authorizes the Fish and Wildlife Board beginning in 2015 to set the annual 16-day deer season by rule. The act allows the Fish and Wildlife Board to set the waterfowl bag limits by procedure instead of going through rulemaking. The act reduces from 100 percent to 60 percent the disability rating that a Vermont resident who is a veteran of the U.S. Armed Forces must have to qualify for a free hunting, fishing, or combination license. The act excludes captive hunt facilities from the landowner exception to the requirements to have a hunting or fishing license. The act also provides that a person may train a hunting dog and pursue raccoon from June 1 through the day before the opening day of raccoon hunting season. The act excludes the taking of animals within 25 feet of a Class 4 highway from the prohibition on taking or attempting to take an animal by shooting a firearm, bow, or crossbow within 25 feet of a public highway. The act also adds muzzle loaders to the list of items not to be shot from or across public highways. In addition, the act specifies that the prohibition on shooting across a public highway shall not apply to an established sport shooting range shooting over a Class IV road. The act authorizes the Commissioner of Fish and Wildlife to put excess funds raised through sales of conservation motor vehicle plates toward the Conservation Camp Fund when the funds collected from the sale of the plates exceed the needs of the Nongame Wildlife and Watershed Management accounts. This act designates the Governor Aiken Bucktail Streamer as the State fly-fishing fly and designates the Mount Holly mammoth tooth and tusk as the State terrestrial fossil.